Today is January 10th, 2017, the 72nd anniversary of the death of Warren "Skip" Muck in the Battle of the Bulge. On this day I would like to honor Skip Muck's memory and his sacrifice by dedicating a blog post to him. I hope you will like it. Warren "Skip" Muck was born in Tonawanda, New York on January 31st, 1922. His parents were German and Warren was fluent in the language. He lived in a house with his mother, his sister Ruth and his older brother Elmer, while his father left his family behind to travel the country playing music. When he was a kid, Warren skipped wherever he went, thus earning the nickname "Skip." Skip was a very religious person. He was a altar boy at his local church and attended mass regularly while he was in the Army. Warren was a true family man. He loved his younger sister Ruth. As children, when she was in need of money, he never failed to lend it to her and he would also go out and buy her roller skates and toys simply out of generosity. When they got older, Skip and his sister had many common friends and often went on double dates together. When they would go to a dance Skip always bought his sister a new dress to wear to the dance and she would always iron his clothes just right since he always wanted them to be perfect. One day, Skip's older brother Elmer returned home all bruised up. When Skip asked him what happened, Elmer told him a bully had beat him up. Without hesitation, Skip went out, found the bully and took care of him on his brother's behalf. Never again did that bully go near Elmer Muck. Skip went to St. Francis of Assisi Elementary School. 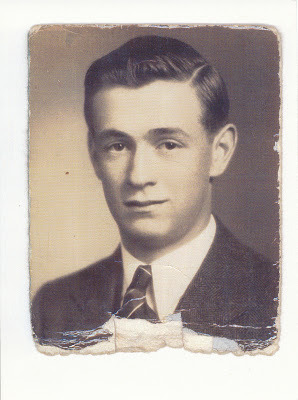 He graduated from Tonawanda High School in 1942. Not only was he good-hearted but he was also smart. 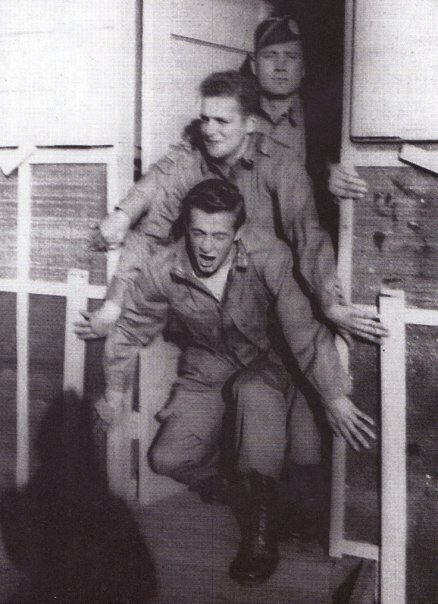 When Skip's high school best friend Fritz Niland joined the army, Skip said, "I'm going! "and enlisted in the Airborne on August 17th, 1942. Paratroopers received 50 extra dollars a month for dangerous duty. This appealed to Skip and was part of his decision to join the Airborne. 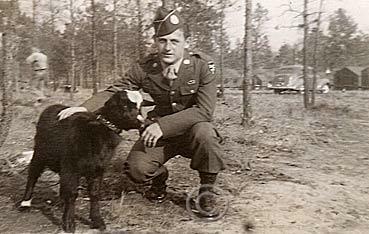 He was assigned to Easy Company, 2nd Battalion, 506th PIR,(later part of the 101st Airborne). AKA "The Band Of Brothers." 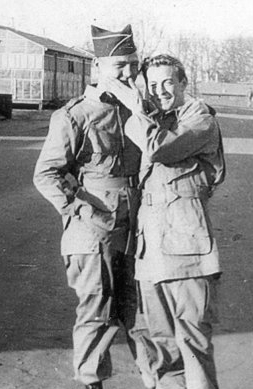 Skip began his training at Camp Toccoa, Georgia, under Captain Herbert Sobel. Sobel was a graduate of the University of Illinois. He had joined the military right after the outbreak of WWII. He was Skip's physical instructor at Camp Toccoa, where he whipped Easy Company into shape, making them run Currahee Mountain on a daily basis, 3 miles up, 3 miles down; this is where the 506th battle cry, "Currahee!" was born. Skip became friends with Don Malarkey while shining their boots together at Camp Toccoa. 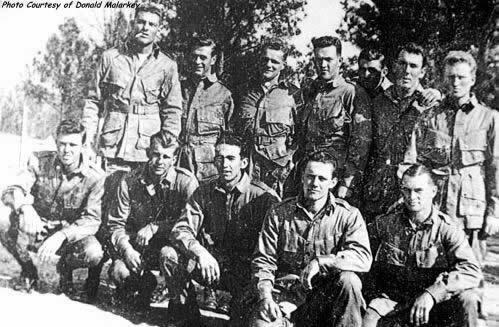 Together they made the 137 mile record breaking march from Toccoa to Atlanta meant for 2nd Battalion of the 506th PIR, and when they were done and heading toward the mess hall, Donald Malarkey couldn't walk, so he advanced on all fours. When Skip noticed this, he said:"No friend of mine crawls anywhere!" Skip then took hold of Malarkey's mess kit and filled both their plates, and ate with his friend in the mess tent. During training, he also met the rest of the company, some of whom he would be with until the last moments of his life. 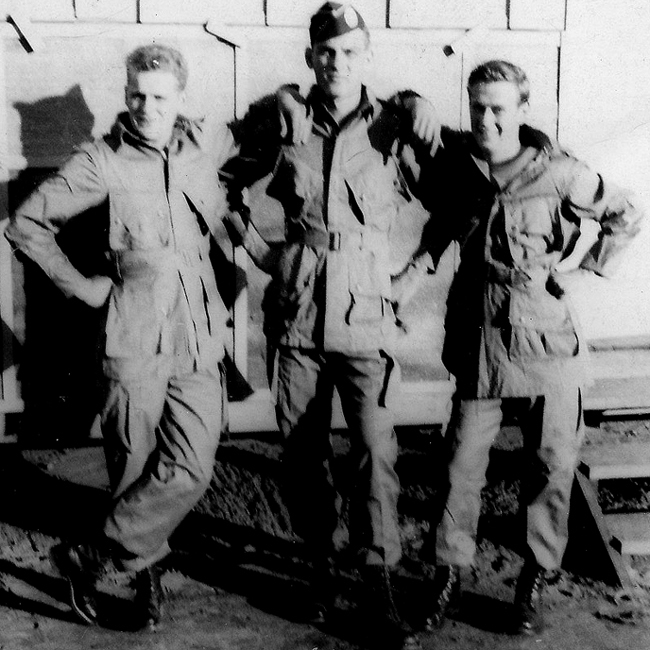 Skip (right) with his two best friends, Don Malarkey and Alex Penkala. 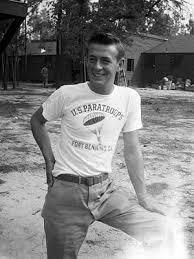 After physical training at Camp Toccoa, Skip went to Fort Benning, Georgia, for jump training. He completed his five qualifying jumps and received his jump wings. The 506th continued traveling around the country preparing for the war at Camp Mackall and Fort Bragg. They finished their training and, in September 1943, they shipped over to England to get ready to fight. The transatlantic crossing was horrendous. The men were crammed into several levels of bunks inside the ship, where it was hot and men were seasick. You would enter the bottom level and would be invaded by a sickening smell from other men who had been sick but were unable to make it to the tiny latrines on time. When Skip and Easy Company arrived in England, they settled in a town called Aldbourne. Here they started advanced training in preparation for D-Day. Now the countdown to D-Day began; it was September 17th, little did they know that exactly a year later they would jump into Holland during operation "Market Garden." In England, Skip met a Pennsylvanian named Joseph Lesniewski. He was a replacement who shipped over to join Easy Company in England. Like most replacements, Joe had a hard time finding his place in the Company, but in classic Skip Muck fashion, Skip approached him and befriended him while he was singing Western songs he had learned back home. As of this moment, Joe had no more problems with the other soldiers in the Company. In June, 1944, Easy Company and the rest of the 101st Airborne moved to their designated staging area in preparation for the D-Day invasion. This was the first time that either one of the Airborne divisions-101st or 82nd- learned that they were going to fight in Normandy. At the field the men checked their bags, watched movies and gambled one last time before sending home all their money in case of their death. The 101st Airborne's objective for D-Day was to secure the town of Sainte-Marie-du-Mont. They were to land 5 miles behind enemy lines and fight their way to Utah beach securing towns and roads along the way. Easy Company's main objective was to secure the town and clear it of any enemies. In Upportery, the men of Easy Company studied, checked and double checked their objectives and on June 3rd, Easy Company moved to the airfield to collect ammo, food and a hot shower. Little did they know this was going to be the last hot chow and shower they'd have in weeks. On a foggy June morning, the men of the 101st Airborne assembled at Uppotery field. It was June 4th and the men were getting ready mentally for what they were going to do. The plan was that the night of June 4th the men would load up and they would fly to Normandy. But the weather looked rainy and unfit for a huge assault. Back a headquarters, General Eisenhower was debating whether or not he should launch the armada. His meteorologist recommended that he call it off. The men of Easy Company received the message that the jump would be postponed through their Commanding Officer Thomas Meehan. Later that day, the men watched movies and smoked cigarettes while waiting for the day to end. While watching a movie, Sergeant "Wild Bill" Guarnere found a letter in his pocket informing him that his brother was KIA while fighting in the battle of Monte Cassino. On the morning of June 5th, the men formed up at Uppotery Field. Like the previous day, they went through their equipment over and over. But this time, they knew it was for real. At 10.15pm, on June 5th, 1944, the men of E Company, 2nd Battalion , 506th, 101st Airborne boarded their airplanes. With the help several other troopers, Skip Muck climbed up onto his C-47. He carried over 130 pounds of equipment, ammo and grenades. The flight over the English Channel proved to be violently bumpy, loud and cold. Despite receiving airsickness pills some men still got airsick, and had to get up to vomit in the back of the plane. It is unknown up to this day whether those pills were supposed to help the men with airsickness or to help calm them down before going into combat. One thing is for sure, the flight was unpleasant. As they approached the French coast, the paratroopers encountered heavy anti-aircraft fire, and because of this, the pilots had to take evasive maneuvers and that's the main reason the soldiers were so spread out after their jump. At approximately one in the morning, Skip Muck leaped out of his airplane and floated down to the earth, where he found himself completely separated from his unit. When he jumped, the force of the prop blast caused him to lose part (if not all) of his equipment. The prop blast also separated many soldiers from their leg bags which contained grenades, ammo, and maps. When Skip landed he was lost and alone in a place he didn't know, but he did eventually hook up with his company. Not much is known about Skip's first night in Normandy. The next day, Skip Muck took part in the capture of Carentan and the battle of Bloody Gulch. Skip survived the battle of Normandy and returned to England unscathed. On September 17th, 1944, exactly one year after arriving in England, the 101st Airborne jumped into Holland for operation Market Garden. Their objective was to capture two bridges near the towns of Son and Veghel. The bridge at Son had been destroyed by the Germans. The next day the 101st attempted to capture a bridge at Best, but that also proved unsuccessful. Throughout the battle, the 101st Airborne repeatedly got pushed back by German troops. Operation Market Garden, for the 101st Airborne was a failure. The allied forces suffered 18,000 casualties. Skip Muck survived the battle, once more, unhurt. Skip (2nd from the left, top row) with his friends after Market Garden. On December 18th, 1944, the 101st Airborne received information that the German forces were going to make one last push to try and break the main line of Allied defense in the area near Bastogne, Belgium. With very short notice, the 101st Airborne boarded trucks to be transported to the front lines. The unit was under-equipped. The poor men entered the battle low on ammunition, food, warm clothes, shoes and anything else that might be useful in a battle. Upon their arrival the Band Of Brothers were greeted by the retreating and beaten down 110th Infantry Division. The men would give anything left of what they had to the paratroopers. 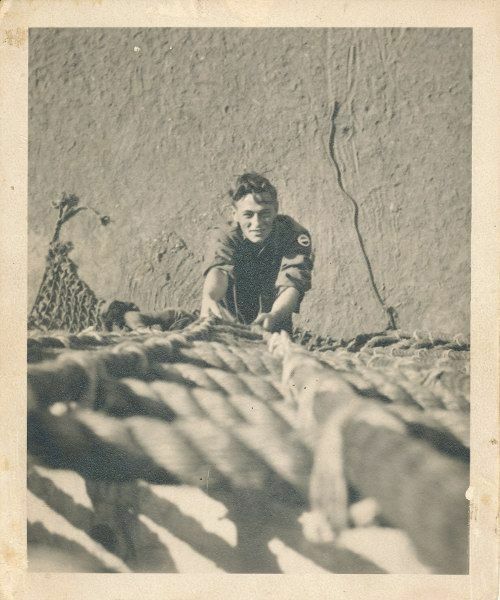 Like the rest of his fellow paratroopers, Skip Muck entered this battle under-equipped and demoralized. The objective for the 101st Airborne in this battle was to hold off the German assault. This was going to be Adolf Hitler's last push to try break the line. If he succeeded, every man knew the consequences would be horrible. On the night of the 20th of December, The 101st Airborne was completely surrounded. Underestimating the grit and resolve of the paratroopers (who they outnumbered five to one) the German generals decided to continue to their objective, leaving behind only one division to fight the Americans. On the 22nd of December, 1944, one of the German generals proposed an honorable surrender to the Americans, saying that the outnumbered paratroopers would be treated with respect. The American general in command, General McAuliffe, answered with his now legendary response: "Nuts!" Click here to read my post about it. That one word gave a huge morale boost to every man in the 101st Airborne. Even though the men had been relentlessly bombed for the past 5 days, they were never going to give up. On the 26th of December 1944, Patton's Third Army broke through and opened a passage out of Bastogne, thus ending the siege of Bastogne. The stubborn German forces continued counterattacking the American soldiers. The soldiers, who were expecting to be relieved, instead got orders to keep fending off the Germans. On January 9th, 1944, Easy Company spearheaded its first assault upon the small town of Foy. The Germans initially pushed back the American forces. The day after the attack, the Germans bombed Jack's Wood (Bois Jacques), where the men of Easy Company were dug in. This bombing is very well depicted in the HBO mini series "Band Of Brothers." Before leaving for Bastogne, Edward Heffron and Skip Muck attended a mass together. At the end of the mass, "Babe" Heffron said to skip, "At least if we die, we're going to die in a state of grace.' Skip replied, 'You're right, Heffron." For the rest of his life, whenever Babe would attend a mass, he'd think of his lost brother, Skip Muck. On January 10th, 1944, during the bombing of Jack's Wood, Alex Penkala and Skip Muck's foxhole took a direct hit from an 88mm shell. When the smoked cleared, the only thing left of Skip Muck was a piece of his uniform. George Luz, who had been crawling over to the foxhole but luckily didn't make it, hollered "I can't see nothin' of 'em, there's nothing there!" Click here to watch the depiction. Advance 7 minutes 30 through the video to see the bombing of January 10th. The video ends at 8 minutes and 10 seconds. Almost a whole month after Patton's Third Army broke into Bastogne, The Battle of the Bulge ended. Overall, it was a success. This battle will forever be remembered as the battle that turned the tide of World War Two, all thanks to the courageous heroes who fought and died in that miserable winter cold back in 1944 and 1945. Warren Muck and Alex Penkala, best friends, fallen brothers-in-arms.